Call now to book your Beach Vacation! community pools. Two bedrooms on main level with guest bath. Master bedroom and master bath are located upstairs and have a private balcony. Bonus fourth bedroom is located on the second floor, jessant to the master bedroom. Beach less then 200 yards with NO ROADS TO CROSS, great for kid's! Destin Commons Shopping Mall and Movie Theater. toilet, shower, jetted tub, Master bath on the second level. toilet, combination tub/shower, Batrhoom 2 on Main level. Dining room seats 6 with four stool at the kitcken bar. Outdoor patio lenght of cottage. Roll-a-way double bed, two double, air beds, air conditioning, cable TV, VCR, stereo, CD player, full kitchen, microwave, diswasher, refrigerator, Ice maker, cooking utensils provided, lines provided, wahser, dryer, jetted tub in bath, hot tub (shared), sauna, 2 pools (shared), covered parking, gas grill (shared) No smoking, No Pets. Korynn was so helpful from the first time I spoke with her about rental. We had never been to Destin, found their cottage on VRBO and we are so happy that we did. Cottage was beautifully decorated, plenty of room and we loved how close the pool was (right outside the sliding back doors). It was just a short walk to the gorgeous beach! We also loved the comfort of Mainsail, it is perfectly close to shops, grocery stores, outlets and restaurants. We would highly recommend staying at the Drake's cottage for your vacation. Looking forward to more vacations and making more memories at "Eagles Landing". Thank you Marie for your kind words. We are glad you enjoyed staying with us at Eagles Landing. We look forward to you enjoying our Cottage once again in the future. We have stayed here many times. It is a beautifully decorated home right across from the pool. It is perfectly situated across from the outlet mall and there are tons of places to eat and grocery stores near by. The community the house is set in is gated with a guard shack and they also drive around in a gold cart to make sure everyone is safe. They have two pools, a hot tub, tennis courts, basketball hoops, a small arcade, large picnic and grilling area and shuffle board. The beach is really close, there are no streets to cross. We love it here and wouldn't stay anywhere else! We really enjoyed our stay. 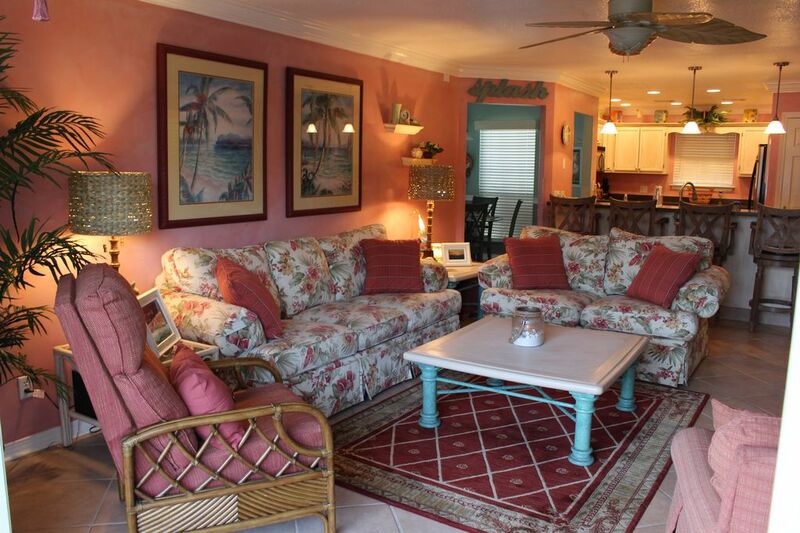 The property was clean and well equipped and only a short walk to the beach! The bonus was the "heated" pool was just steps from the back door! Our stay was great! It was a beautiful property and dfor 8 of us there was plenty of room. The home was decorated very pretty and each bedroom had its own personality! The upstairs bathroom was Wonderful, especially the shower!! We had a great time and would go back again!! waterskiing, surfing, windsurfing, parasailing, jet skiing, shelling. Nightly Rate: $150 - $375 Weekly Rate: $1000 - $2450 Monthly Rate: $0 - $0 Spring: Mar 01 - Mar 08 $215/day $1400/week Spring Break: Mar 08 - Apr 12 $270/day $1800/week Spring: Apr 12 - May 17 $250/day $1650/week Summer Peak: May 17 - Aug 9 $375/day $2450/week Summer: Aug 9- Sep 06 $275/day $1800/week Fall: Sep 06 - Oct 31 $225/Day $1500/week Winter: Nov 1 - Feb 28/29 $150/day $1000/week Winter Monthly Rental $1750 Note: Summer Rentals are Saturday to Saturday, May 15 - Aug 30 Note: Until confirmed, rates are subject to change without notice. Holiday rates will vary. Additional fees: Florida tax, cleaning fee will be added to rental fee Security deposit required for all rentals.